Sales numbers from the Houston Association of Realtors (HAR) are out for August 2015. Check out the press release. A few highlights, the median sales price (the figure where half of homes sold for more, half sold for less) rose 4.9% year over year to $215,100. The average sale price rose nearly 3% to $282,233. 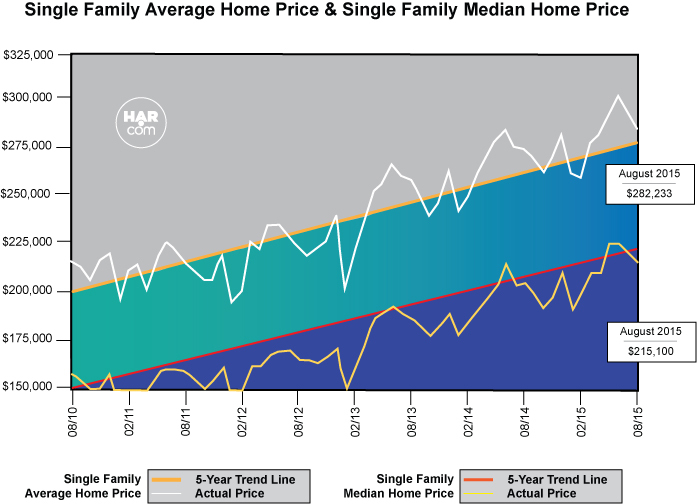 This means prices are still strong for the Houston area. The number of property sales has seems to have finally stabilized, with the total property sales and total single-family home sales basically the same as August 2014. Months of inventory have increased year over year by half a month to 3.5 months. This is still well under the national average of 4.8 months of inventory. Take a look at some of these figures in the table below. More comprehensive information broken out by market segments or category is available by request. Welcome to the CENTURY 21 Realty Partners blog! This is our inaugural post, and we would like to personally thank you for reading it. What kind of information will you find on our blog? Well the latest real estate industry and economic news for one. Demystification of common real estate terms and concepts for another. Or how about, local market information and developments. Coupled with practical information and advice about buying or selling a home. All of this liberally sprinkled with our own personal zest and charm. Stay tuned! Great things are happening at CENTURY 21 Realty Partners, and we are proud that now we can share them with you and the world.